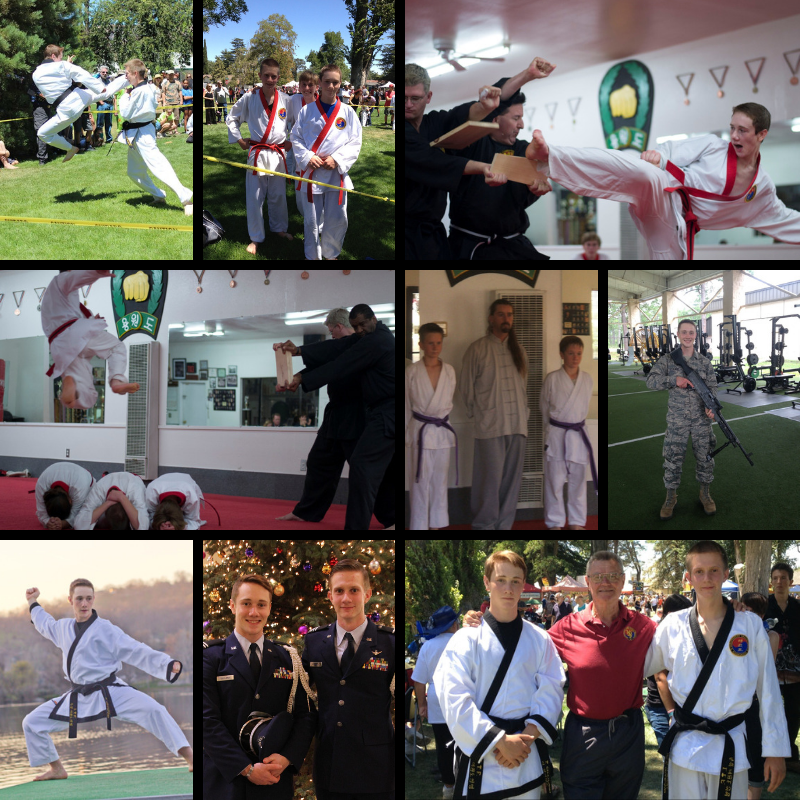 I started at Tehachapi Martial Arts Center when I was in sophomore year of high school. The Jadric’s quickly became a family to me, and a stable foundation that I needed during that time in my life. Mr. Jadric taught me discipline, Mrs. Jadric taught me patience, Ms. Ivanna taught me compassion, and Mr. Chris taught me how to take a kick to the head. Being in training at TMAC was the first time I learned how to push myself and how to step outside of my comfort zone to accomplish something better than what I had been before. TMAC prepared me for my five years in the United States Marines and the continuing challenges that I face to this day. The Jadric family was a major part of my life for all my formative years and provided a lot of stability through some very rough times. While I was at the studio a lot of things were happening behind the scenes in my life. My brother committed suicide, my dad passed and my mom raised me after that on government assistance. Master Jadric let me go there for free for years. Because of my involvement with the studio, I was able to get a job at a local machine shop and move out at 18. Later on, I was able to get a lead position and then became a supervisor of a small team. This all happened when I was dirt poor walking and bumming rides to TMAC. I was around a lot of drugs and crime at that time. But even If I didn’t show up for weeks, Mr. Jadric never turned me away. Once I hit 18 and had a job and my own place I started paying for my lessons again. Sometimes my payment was late cause money was tight, again Mr. Jadric never charged me a late fee, never said a word. After I turned 18 the crowd I was around was not a good one. And a lot of bad things continued to happen. But TMAC was there; eventually, I joined the military, got an associate, a bachelors, and a masters degree. Now I currently manage a multi-tiered manufacturing team of about 80 people. I nearly flunked out of school. I had many friends and family pass in a small period of time. There where a lot of rough situations. But the stability the Jadric family and TMAC provided was a lighthouse in the storm that gave me direction. I am sure everyone takes something different out of the training, but I simply feel like it instilled in me a sense of the need to get stuff done. For better or worse you still have a job to finish. And to stay humble about it( took me a while to get the humble thing). Training at TMAC was a life altering experience I would recommend to anyone looking for inspiration to become a better version of themselves. As a woman, learning the practical self-defense techniques of Combat Hapkido, is both empowering and humbling. The foundation of the style is taught in a way that each technique can branch off and evolve to work for a person of any age, size or gender against any attacker in any situation. The opportunity to teach increased muscle memory of the basics while enlightening the teacher to the different ways people learn and, as such, adapt as a leader. It brought confidence to myself as a young teenager trying to define not only myself but the world around me by allowing me to learn these skills, amongst many others, and hone them in a safe and encouraging environment. GM Jadric, his family, the instructors and peers at TMAC go out of their way to make the studio feel like a second home. Their patience, empathy and knowledge to teach the discipline of martial arts is something I will always respect and feel gratitude for. We love Tehachapi Martial Arts Center! My kids started in the Kick Starts class 2 years ago and we can’t say enough about the Jadrics and the whole TMAC family. Not only are my kids learning martial arts but their teachers at school also noticed a difference in self-control and confidence after we started here. To attain the renowned rank of black belt: every new student dreams of this. The few that do earn the rank, (with emphasis on “earn,”) keep that honor for the rest of their lives. Of course, becoming a black belt is not the end of the journey. Minimally, a black belt should be able to look back on yesterday, honestly strive to be a better person now, and make the world a better place because of it. This is what TMAC has done for the black belts it has produced, including me. My physical and mental condition would probably be in a totally different world if not for the training I’ve received; from the exercises, and the foundational mindset taught. The intensity, discipline, adrenaline, and focus that have been part of the training regimen have truly caused me to be a more calm, confident person. When I started classes, I didn’t even fathom reaching the rank of black belt. As I first entered TMAC in November 2008, I had no comprehension of where I would be two years later . . . and for that matter five years later training for my black belt test, or 10 years later, training for my next test in life: Air Force Special Tactics Assessment and Selection. I know for a fact that Tae Kwon Do has done good by me; I just hope that I have done good by Tae Kwon Do. As for self-improvement, it’s dramatic. Just as it was supposed to happen, the training enhanced me physically and mentally, but most importantly, the Jadrics helped teach me how to give of myself. I’m deeply grateful for their persistence and heartfelt efforts in teaching wisdom and technique alike.